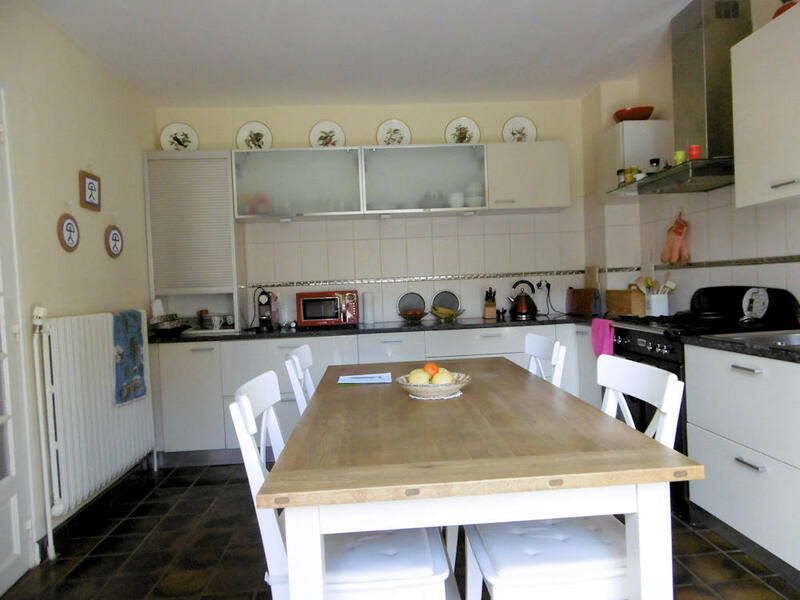 Brittany – Immaculate, Detached Breton House. Woods & Paddock. 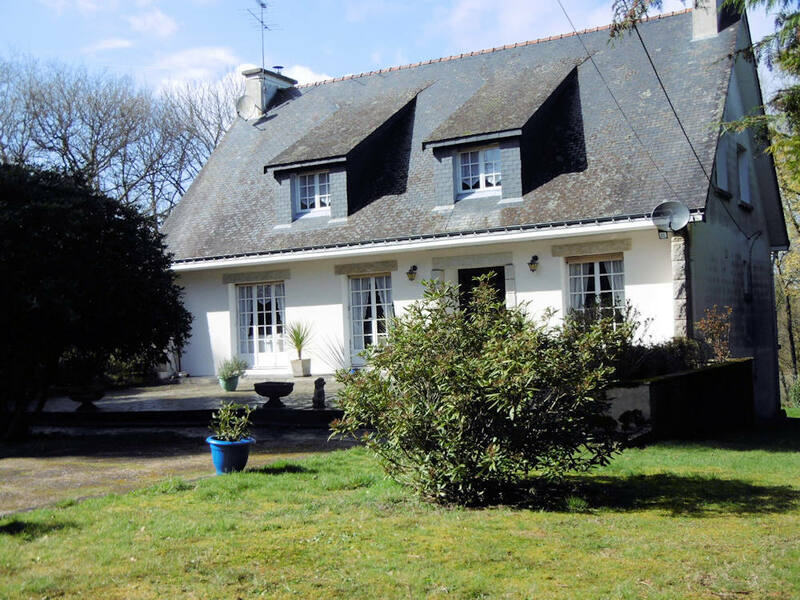 Built in 1972 this large home is peacefully set in the countryside, semi-rural location with no immediate neighbours yet within five minutes of the small town of Bubry and eight minutes from the larger vibrant town of Guemene-sur-Scorff where you will find a good selection of shops, café bars and restaurants and much more. The house faces almost due South and is protected by a line of fir trees to the East, a wood (including a well) to the North and a further wooded valley to the West. There is also part of a field to the East currently loaned to a local farmer. There are two separate entrances, both with double iron gates. The main entrance is a 40m drive up to a large slate terrace in front of the house. The second entrance to the side of the home is slightly longer and leads to the rear of the property and access to the garages and the wood. 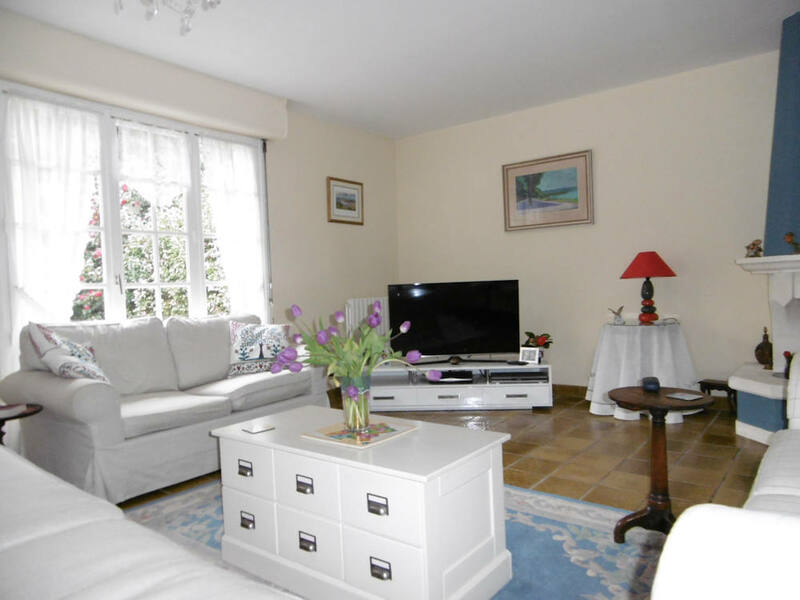 For those who need easy access to and from the UK the home is perfectly placed for quick access to St Malo (2hrs drive) ferry port with crossings to Portsmouth or Roscoff (1hr 30mins drive) with crossings to Eire and Plymouth. 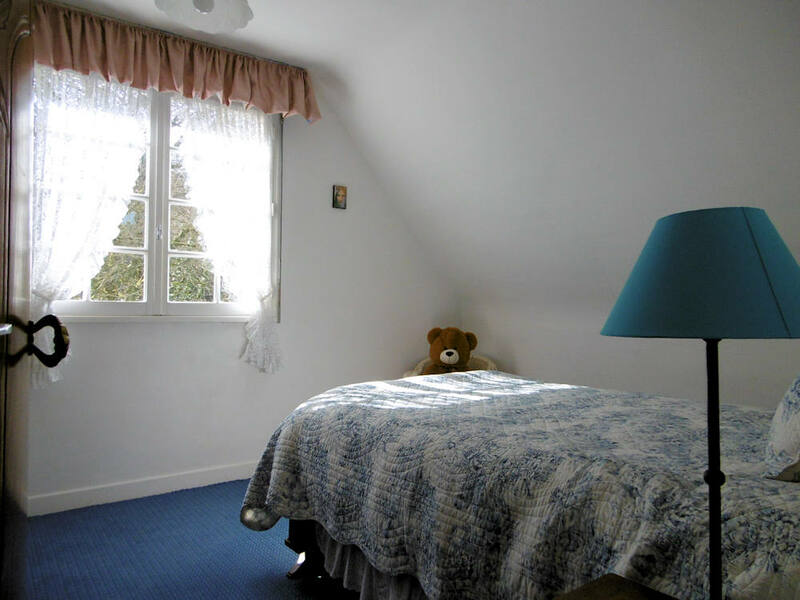 Low cost flights are available at Dinard, Rennes and Brest from a host of UK airports served by low cost airlines making the home convenient for visiting guests and family. MAIN ENTRANCE: 2m x 3.9m - Double wooden doors with protected security glass panels which can be opened in the summer. Double security locks. 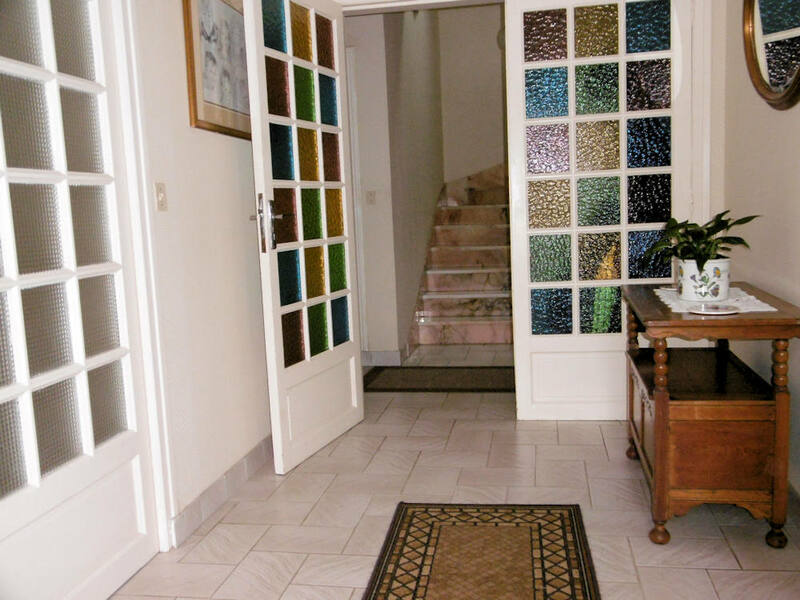 Tiled floor, with glass panelled doors leading off to the kitchen and living room, plus double coloured glass panelled doors to the second hallway. Power and telephone points and radiator. 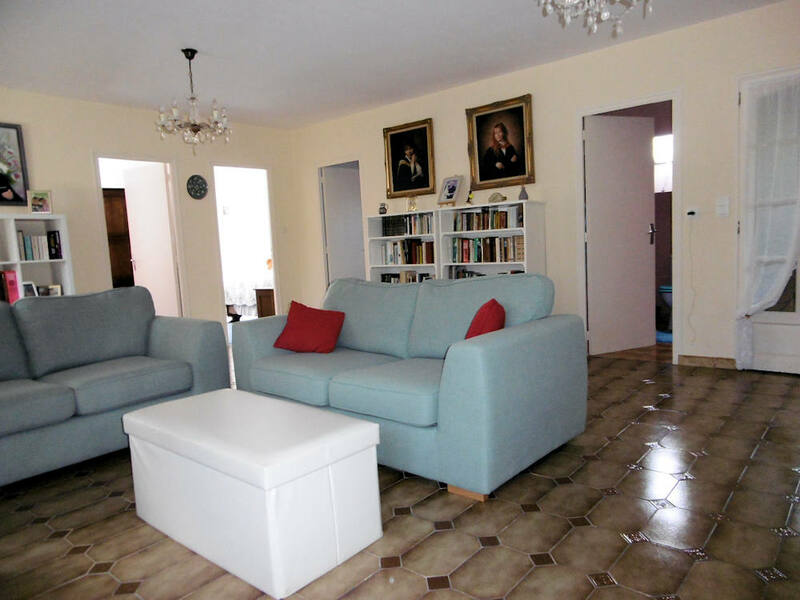 SITTING ROOM AND DINING ROOM: An ‘L’ shaped room, the sitting room is 4.5m x 8m. 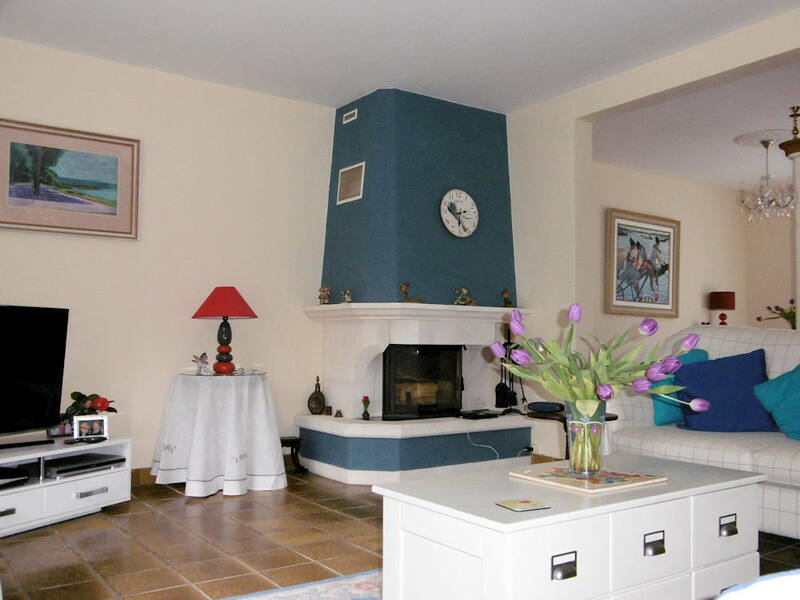 - tiled floor and has a built in wood-burner. There are two sets of double doors leading out onto the terrace. There are 3 radiators, several power points, a TV point and a connection for the internet. There is also a chandelier. 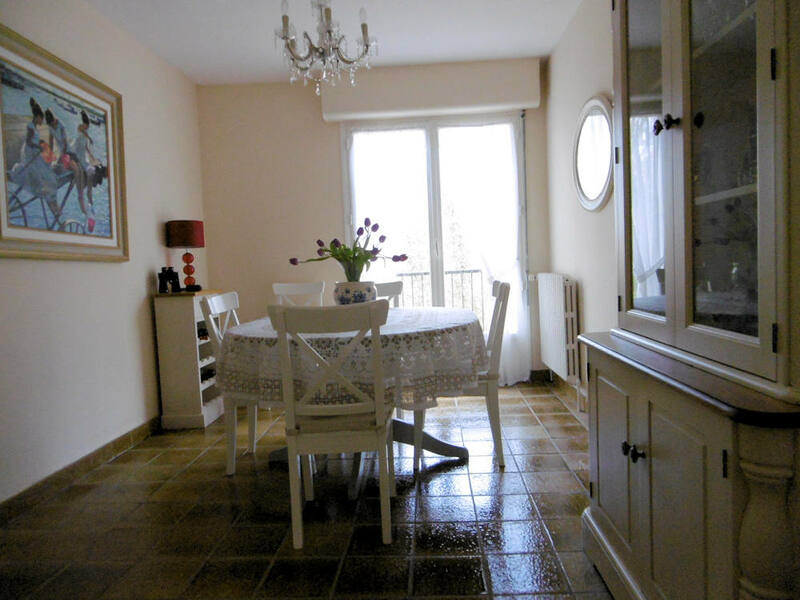 The dining room measures 4.2m x 2.8m – tiled floor and has double doors leading onto a small balcony which overlooks the rear garden and woods. There is a radiator, several power points and a chandelier. 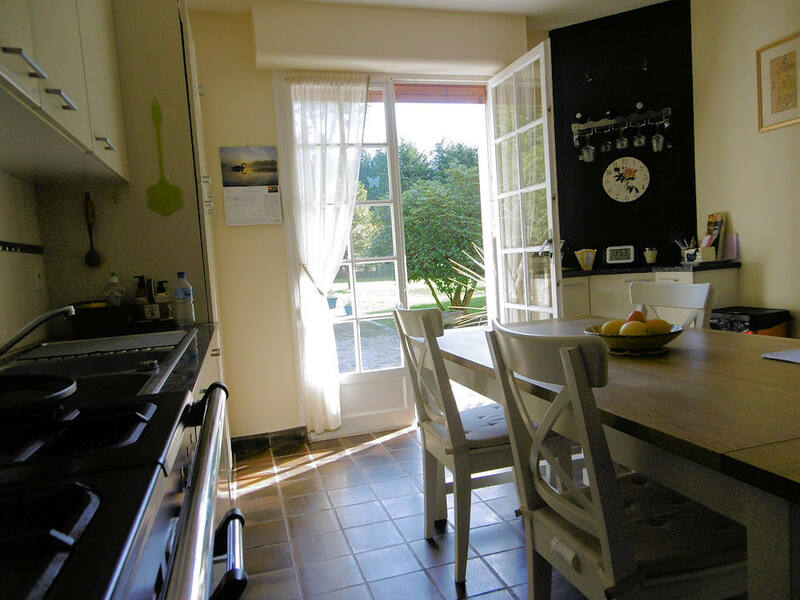 KITCHEN: 2.9m x 3.9m - with tiled floor and double doors to the terrace. There is a range using both gas and electricity, a built-in fridge\freezer and dishwasher, double drainer sink, and an extensive range of integrated units plus a wine rack. INNER HALL: 5m x 2m - tiled floor with radiator and doors leading to bedrooms 1 & 2, bathroom, separate WC with wash hand basin and radiator. Also there is a door to the basement, and a beautiful marble staircase leading to the mezzanine floor. BEDROOM 1: 3m x 4m - double doors lead to small balcony overlooking the rear garden and woods, there is a radiator and power points. A wardrobe, dressing table and two single beds are available if required. 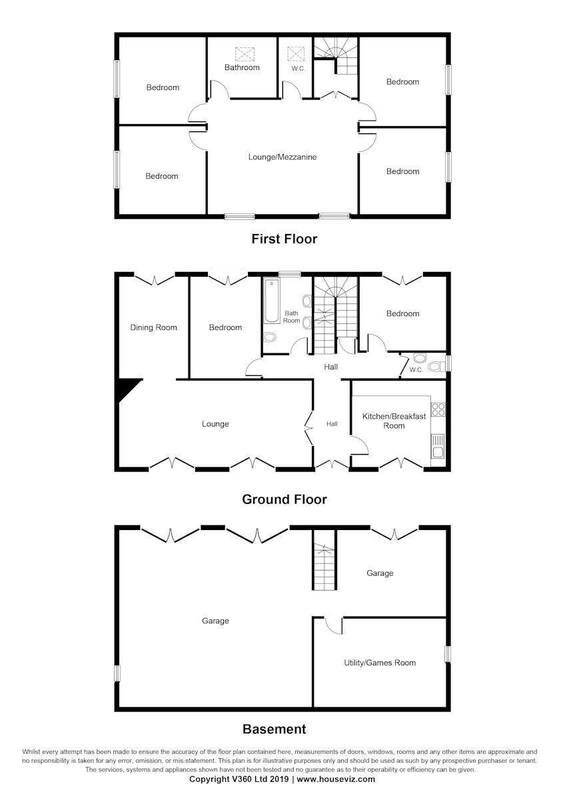 BEDROOM 2: 3.5m x 3.2m - Double doors lead to a small balcony overlooking the rear garden and woods, there is a radiator and power points. A wardrobe and two single beds are available if required. BATHROOM: 3m x 2m - tiled floor with radiator and power point. Bath with hand shower attachment, “his & hers” hand basins and bidet. WC with hand basin: tiled floor with radiator. STAIRCASE: 88cm wide marble staircase with iron hand rail. MEZANNINE FLOOR: 5.5m x 6.7m - double glass panelled doors lead to a tiled floor with two double windows looking out over the front garden. There are two radiators, numerous power points, TV point, and two chandeliers. 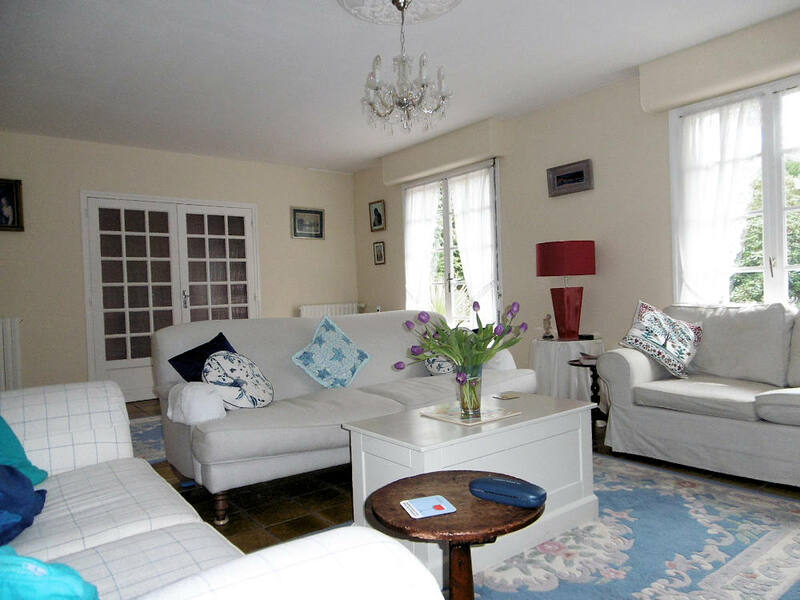 One area is currently used as a study, the remainder as a second sitting room. There are doors leading off to four bedrooms, another family bathroom and a separate WC with hand basin. BEDROOM 3: 3.2m x 3.5m - with radiator, power point and double window. 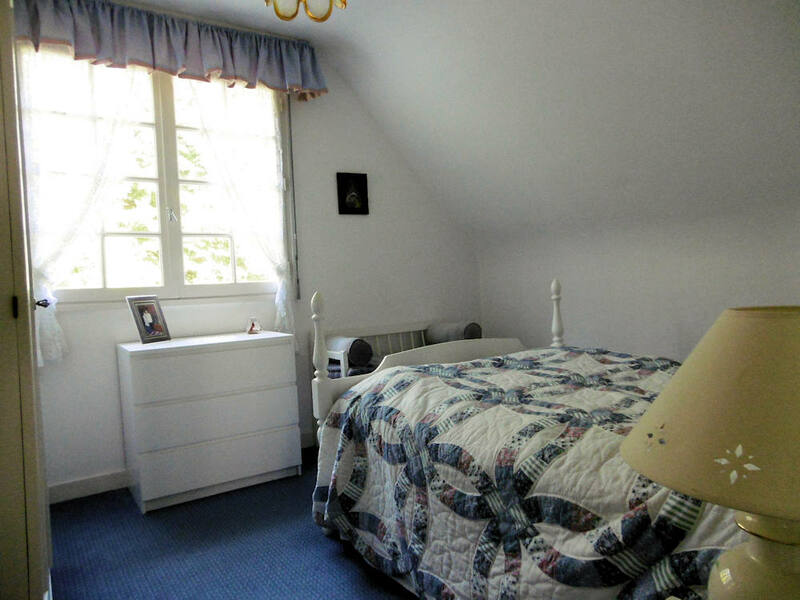 A wardrobe, chest of drawers and double bed are available if required. BEDROOM 4: 3.2m x 3.5m - with radiator, power point and double window. A wardrobe and chest of drawers are available if required. BEDROOM 5: 3.6m x 3.4m - with radiator, power point and double window. 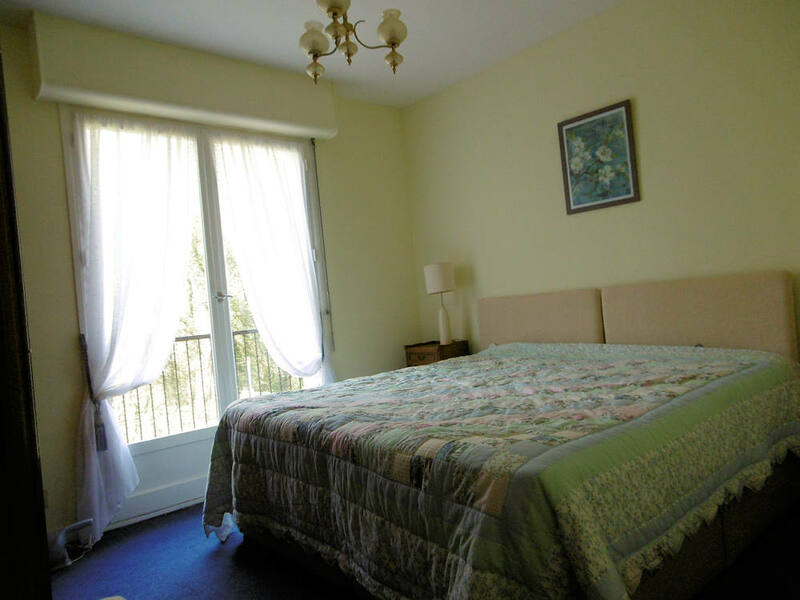 A wardrobe and double bed are available if required. BEDROOM 6: 3.6m x 3.4m - with radiator, power point and double window. 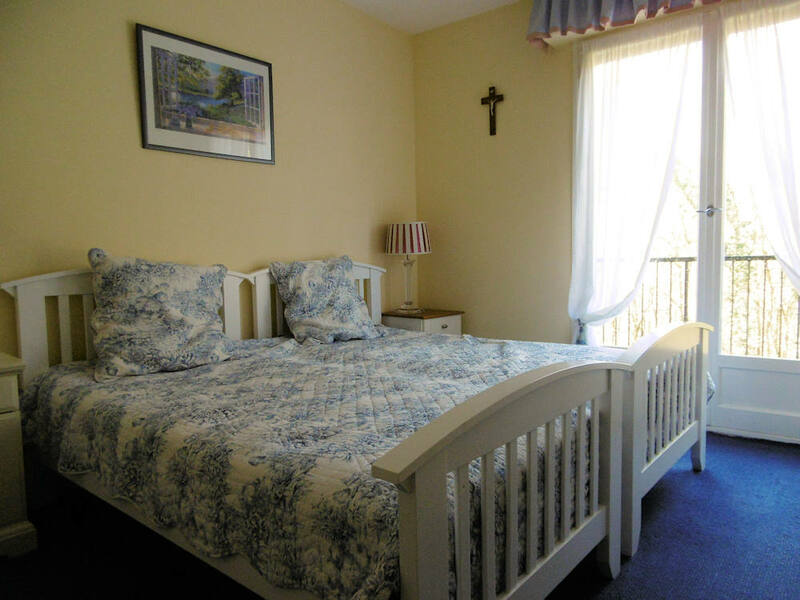 A wardrobe and double bed are available if required. BATHROOM: 2.4m x 3.2m (excluding built in bath) - tiled floor with radiator and power point. 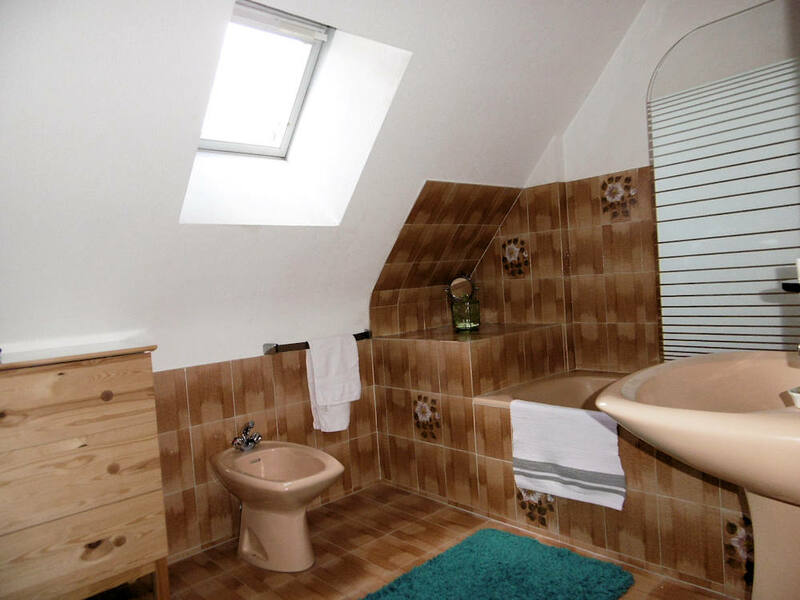 Built in bath with shower over, matching hand basin and bidet. WC: with wash hand basin and access to the loft. The whole house has shutters to the windows and patio doors. Stairs from the inner hall lead down to a sous sol (basement) the size of the entire ground floor of the property, consisting of three garages. One is currently used for garden equipment and when the other two are used for cars there is still ample storage room for wood etc. Each of the three garages has their own separate sliding doors. 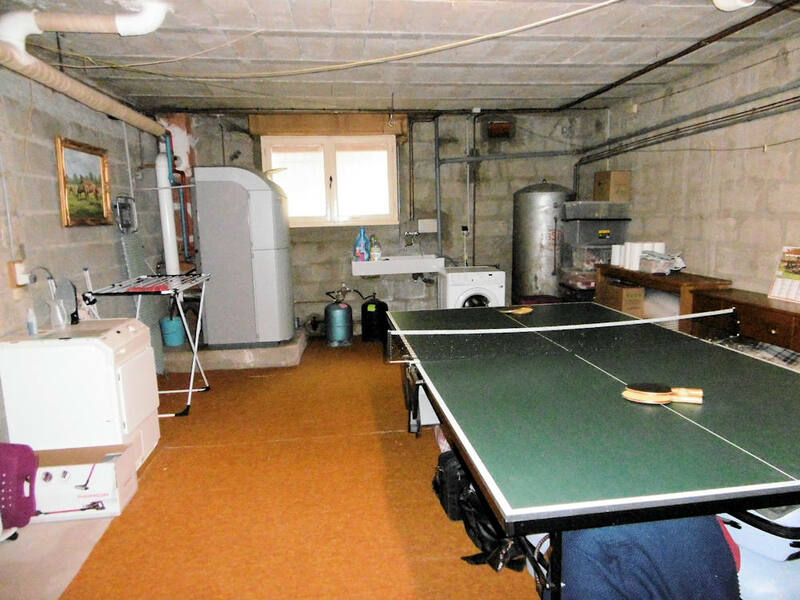 Within the area is a separate room used as a laundry room and games room (full size table tennis table included). There is a Belfast sink, clothes lines, and shelving. The oil fired central heating boiler, a separate water tank for the Well (not currently connected) and the mains water tap are located in this room. FRONT GARDEN : 1,200 sq m (less terrace) of lawn (separated by the drive) with mature trees, rhododendron and azalea bushes. TERRACE: 150 sq m slate surface with flower borders, sunshade point and access to the underground oil storage tank. 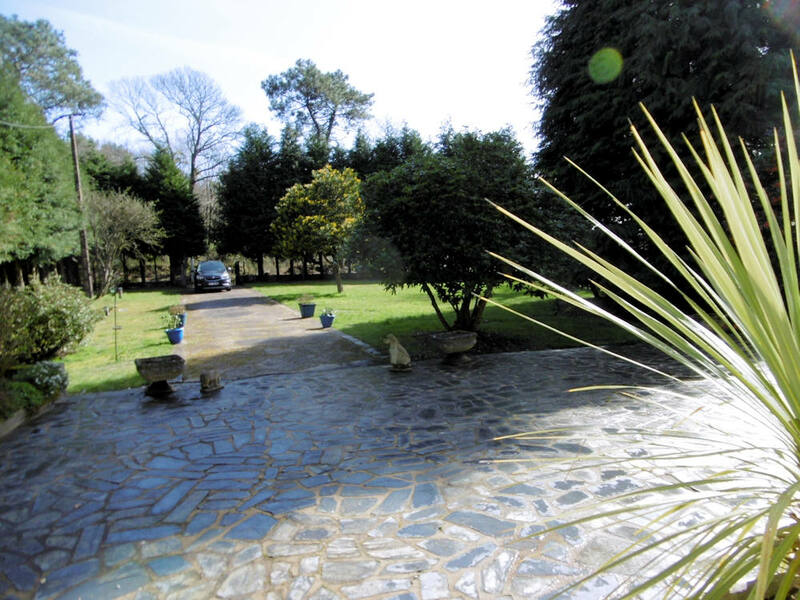 REAR GARDEN: 240 sq m part drive way access to garages and part lawn with flowering plants. An iron gate leads to the wood and the location of the ECO FLOW sanitary system recently installed to comply with the latest French regulations at a cost of 12,000 euros. THE MAIN WOOD: Almost 8,000 sq m (2 Acres) with a Well in the bottom North West corner. The Well has an electric pump but has not been connected or used by the current occupants. However, the previous occupants claimed to have used it. There is a Viking ride-on mower, petrol and electric chainsaws, petrol and electric strimmer, petrol hedge cutter, electric leaf blower and numerous tools for sale. 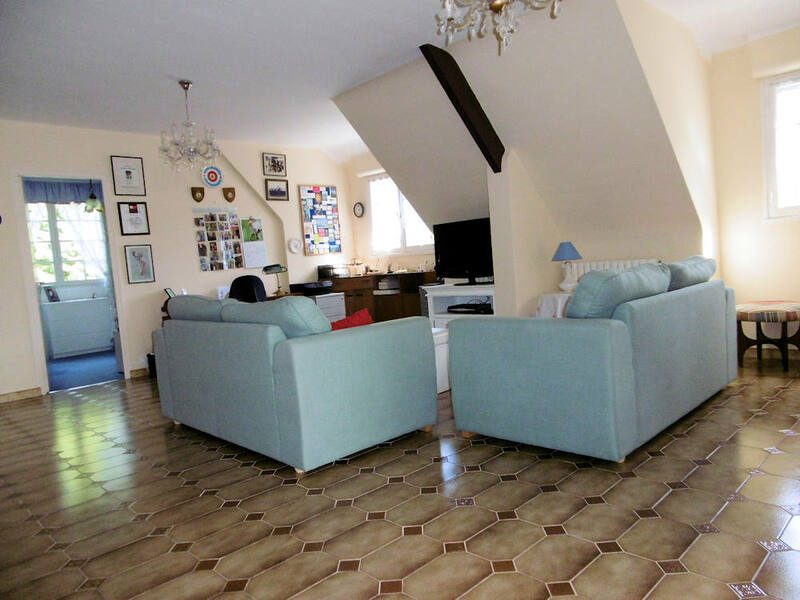 Included in the price of the property is 4 years worth of cut logs valued at 1,000 euros.